As any SCCM administrator will tell you, ConfigMgr does not offer the option to deploy EXE files in a direct manner like MSI files. Fortunately, working around that limitation is easy. 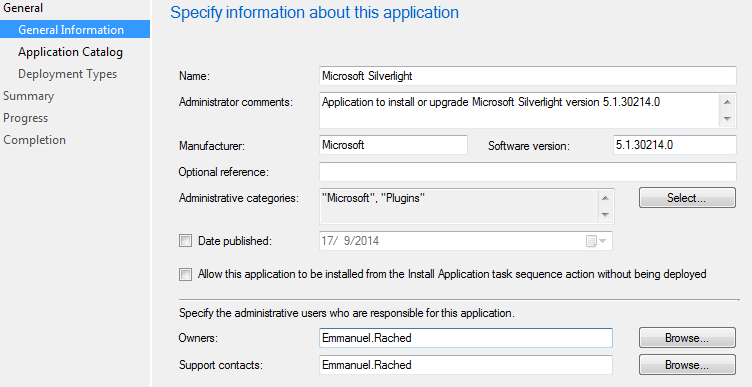 I will use the Silverlight setup as an example in this article. This can be applied to any EXE setup file. Note: Always dedicate a central share location to store all System Center files. Proceed to Application Catalog and fill out the additional details as needed. Be sure to specify a relevant icon as well. Continue to Deployment Types and click Add. 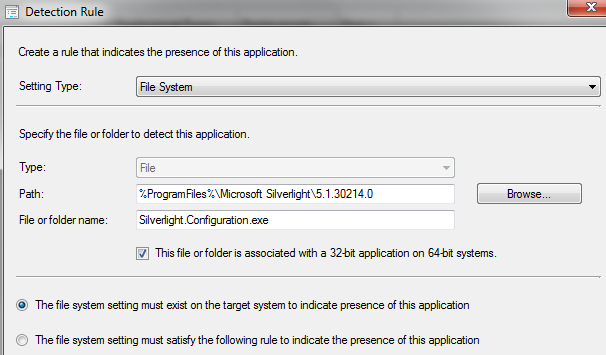 We will create the Deployment Type as MSI deployment but we will use the EXE setup file of Silverlight. Keep the default option of Windows Installer (.msi) and choose “Manually specify the deployment type information” option. Fill out the relevant information and continue to Content. 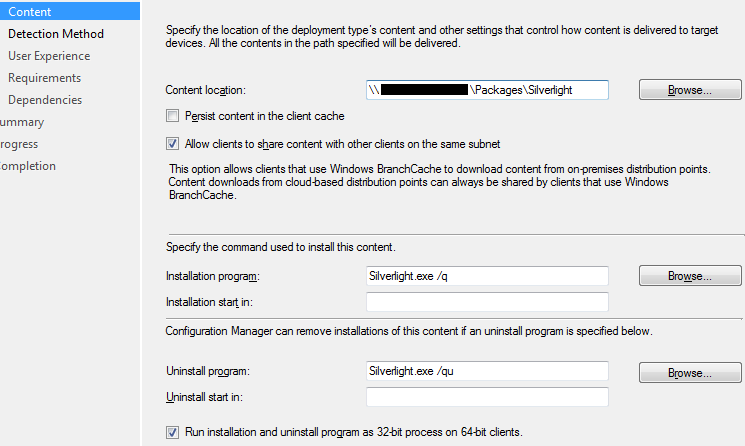 Click browse next to Content Location and specify the location of the System Center Library share where the Silverlight package is present. When you click the Browse button next to Installation Program, you will notice that you cannot select EXE as the file type. You can however directly type the EXE file name and SCCM will accept it. Proceed to do that and delete msiexec /i from the Installation Program parameters. Add any relevant switches to automate the installation as per your application documentation. For example, most InstallShield based setups allow you to run setup in record mode by using -r parameter. This will generate a .iss file can be used to automate the installation by specifying -s switch to play back the recorded installation. You can also specify the uninstallation program should you need SCCM to uninstall this deployment in the future. Search the registry where the application is already installed to determine the proper uninstall commands. An additional option to mention is Run installation and uninstall program as 32-bit process on 64-bit clients. This allows the installation to automatically determine where the files should go depending on Windows being 32-bits or 64-bits, for example to X:\Program Files or X:\Program Files (x86) if %ProgramFiles% is specified. Proceed to Detection Method. You will need to determine how SCCM will detect if your application is installed or not. Detection clauses can use File or Folder detection, Registry Key detection or Windows Installer based detection. Any easy way to specify what will constitute the clauses is to search on a workstation where the application is already installed for the appropriate files and registry keys. You can add multiple detection clauses, group them together to specify evaluation order and combine them using logical operators (AND/OR). Proceed to User Experience. Customize the settings as per your need and continue with the wizard. If any Requirements must be met for this application, such as specific Operating System version or free disk space, specify them in the Requirements section and proceed. If any dependencies are needed specify them here. More on Requirements, Dependencies, Supersedence and other settings in a later article. 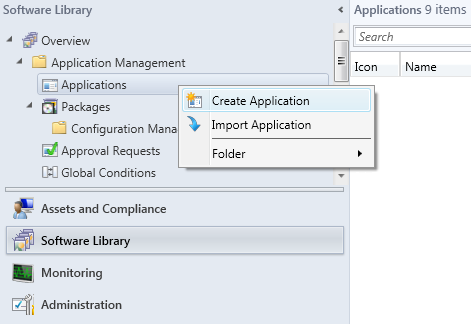 Finish the Deployment Type wizard and finish the Create Application wizard. Your application is now ready to be distributed to Distribution Points and deployed to the required collections. Additional general information about application deployment with SCCM can be found in this Technet article. When we were in the process of migrating our SCCM 2007 hierarchy to the newly installed SCCM 2012, we encountered around 150 revoked clients that were being denied registration. While the vast majority of the agents functioned properly, these particular agents remained unable to register with SCCM 2012. That was odd since these clients were new and we have never revoked any certificates. We generated a new GUID for the agent by deleting %windir%\smscfg.ini and restarting the SMS Agent Host service. The same behavior remained and the server still rejected the registration for the new GUID with the same error. Nevertheless, we again deleted smscfg.ini and we used SMS Toolkit to run CCMDelCert.exe on a problematic workstation. We restarted the SMS Agent Host service but the issue remained. We tried again but this time we deleted the agent and reinstalled it after the cleanup, the issue persisted. We reinstalled the secondary site and pushed all agents. The same issue remained and problematic clients appeared again. Even though all the troubleshooting steps generated new GUIDs, the server was still rejecting them with the same error message. The root of our revoked clients problem had to be coming from the primary site and its database. Caution: directly modifying the SCCM database is not recommended nor supported by Microsoft and should be extensively tested. Only perform update queries after taking a full backup and when advised to do so by Microsoft support personnel.